Most Able students (formerly known as 'Gifted and Talented') have been defined as those students who have one or more abilities developed to a level significantly ahead of their year group (or with the potential to develop these abilities). Talented pupils demonstrate a talent or skill in creative or sporting fields in and/or out of school. In all definitions there is the recognition of the distinction between the term more able and the term talented. Most Able students appear to be more able over a wider range of academic areas while talented students appear to generally excel in one particular creative area. Most Able pupils are those who will exceed the expectations for their age group, either in all subjects or just one. The Most Able are a diverse group and their range of attainment will be varied; some do well in statutory national curriculum tests or national qualifications. However, being Most Able covers much more than the ability to succeed in tests and examinations. Most Able students comprise around 5-10% of the academy population. At Harris Garrard Academy we identify the Most Able students in all subjects. The Leader for Most Able is Eleanor Maddocks and the Leader for Talented is Esther Alonge. Further documents and policies relating to our support for ‘most able' students can be downloaded from our Equalities and additional intervention page. How does the academy identify Most Able students? showing exceptional attainment in a range of subjects in the first term of Year 7. Most Able students are identified and placed on the academy’s Most Able register. We give particular attention to disadvantaged Most Able students. We recognise that nationally Most Able students do less well in schools where they are in the minority, Most Able boys do less well than Most Able girls, and Most Able Disadvantaged Students do less well than Most Able non-Disadvantaged students. The register is reviewed and updated regularly during the academic year, based on hard and soft data. Most Able students are not removed from the list if underperforming, instead additional intervention is agreed for these students. 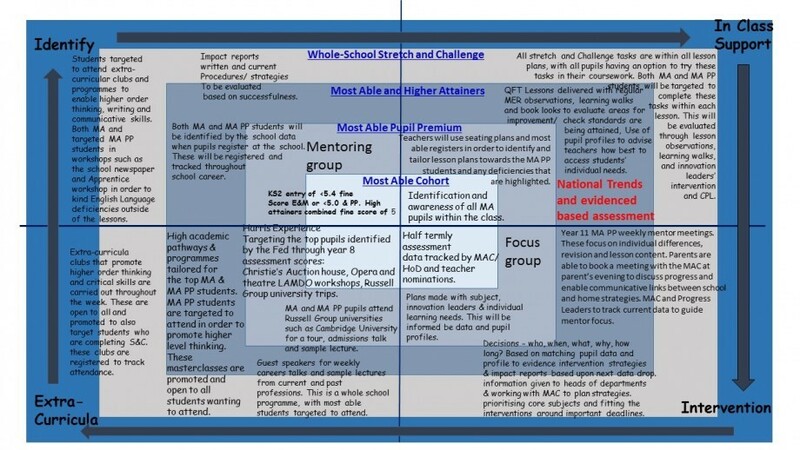 Pupil Premium grant money is allocated for this where students are eligible. We have developed a culture of high expectations for students and teachers so that the quality of curriculum delivery, teaching and assessment in both foundation and core subjects is high. This begins with identification based on Key Stage 2 data, rigorous target setting and careful tracking and intervention. Most Able Leader nomination – using data that tracks the performance of students, the Most Able Leader will also examine nominations to make sure the correct students are identified and placed on the register. Parent consultation – we will consider parental nomination and welcome any background, knowledge or evidence of a pupil’s work done at home if appropriate. This information will be cross referenced to performance data and the academy decision is final. What are the opportunities and events for Most Able students? The Brilliant Club – 12 arts and humanities students will be mentored through an assignment by a PhD research student in half term 4. The Challenge Project – KS3 pupils attend masterclasses in key subject areas from across the curriculum. They will hone their knowledge and develop practical skills with the support of subject specialists.